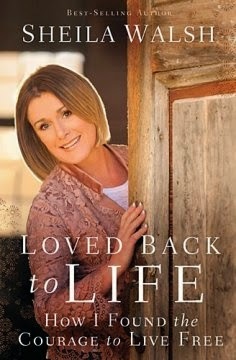 "Loved Back to Life: How I Found the Courage to Live Free" is the newest book by Sheila Walsh. It follows her struggle with depression, something near and dear to my heart. At a time when she seemed to have it all, she was struggling. She shares her story of coming to her lowest point, her journey to living again and how God was with her all along the way. This book may sound familiar to her fans. This is the update to her 1996 book, Honestly. In "Loved Back to Life" we get to see how far she has come almost 20 years later. It's no secret that I'm a fan of Sheila Walsh. In 2011, I heard her testimony for the first time at a Women of Faith Conference. Mental illness, specifically depression is something that affects my mother's side of the family. Since the teenage years, I have struggled with it myself. Growing up, my family taught us not to talk about anything with anyone. As an adult I have come to realize the importance of seeking and sharing with those who may be dealing with similar struggles as us. One of my main supports,has been my church. The past two churches I've attended/been a member of, have shown me love and compassion during my struggle. I know that not all churches nor society in general know how to love on people struggling with mental illness. Some still don't understand that is indeed an illness and not a personality/character defect. This is why I'm so glad that Sheila has shared her testimony. Though it came with adversity, she has given so many people hope for what's on the other side of the struggle. The book is easy to read. Shelia has a way of writing that she comes across to the reader as a loving friend. One who has been there at the lowest point too, has made it and wants to see you make it there. This isn't a guide on how-to get over depression, because the truth is that many people will struggle with it for the rest of their lives. It's a testimony that you can get to a better place mentally and that God will be with you every step of the way.